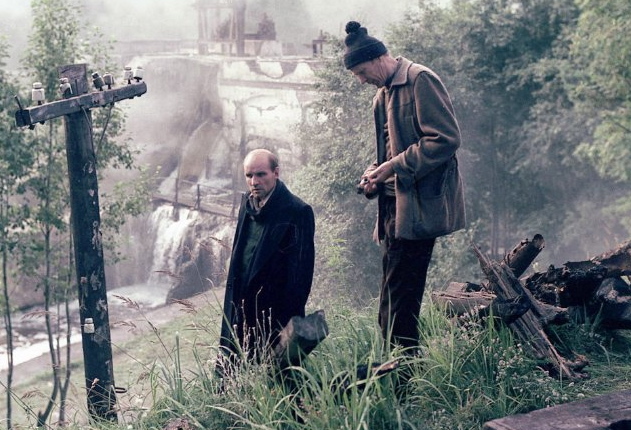 Picking up somewhere on the other side of civilization’s demise as documented by Godard’s Weekend (Essential Movie Library #31), Russian director Andrei Tarkovsky’s “stalker” longs to be a holy fool if only he can find the faith. When he can’t, he’s an “eternal prisoner” instead, as his wife calls him at the end of this spellbinding film that visually unfolds in steampunk sepias and inky miasmas. The stalker is a man of eyes and ears leading two other men—one of words and one of science—out of their contemporary ruins into the forbidden Zone, the hub of which is the Room, a kind of decrepit cathedral where the lost and nihilistic make pilgrimage when their brilliance isn’t enough to understand what’s missing from the world. Beneath the stalker’s reverence is dread that the Zone won’t deliver him to a place beyond doubt after all. “When a man thinks of the past, he becomes kinder,” he half declares and half wonders—the subtext of a movie about a maybe-future that resembles the maybe-present of David Lynch’s Eraserhead, made around the same time half a planet away. When a dream is a memory of the future, however, the future is authenticated by what’s unanswered; this movie is haunted by its questions. That Tarkovsky, increasingly at odds in his life and career with the godless Soviet Union, is the most spiritually obsessed of great filmmakers isn’t ironic but inevitable. Here he’s as determined to map his own inner quest as the movie’s eponymous voyager, apropos for a filmmaker who would shoot such a movie all over again when the original negative proved unusable. Not only is Stalker outside of time but, watching it, the viewer tumbles outside time as well, the movie imposing its own sense of temporal passage, the rest of the world having stopped during nearly three hours that feel as consuming as lifetimes and as fleeting as moments. Previous articleHow Did Downtown Santa Monica Become a Chain Restaurant Mecca?